← My wife hangs out with a bunch of turkeys! Looking for that wascally wabbit………. 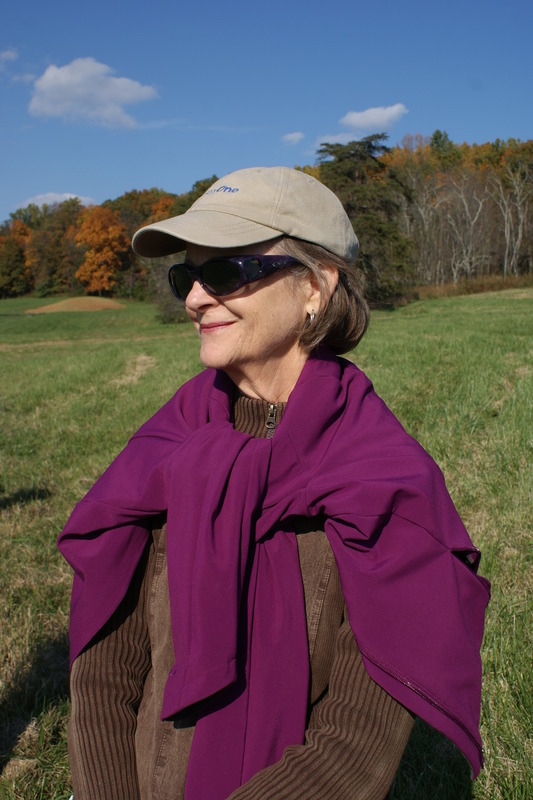 Over the past couple of years, my wife Patty and I have enjoyed a pastime that offers many benefits: exercise, the great outdoors, friendship and a chance to observe nature at work. It’s called “Beagling”. 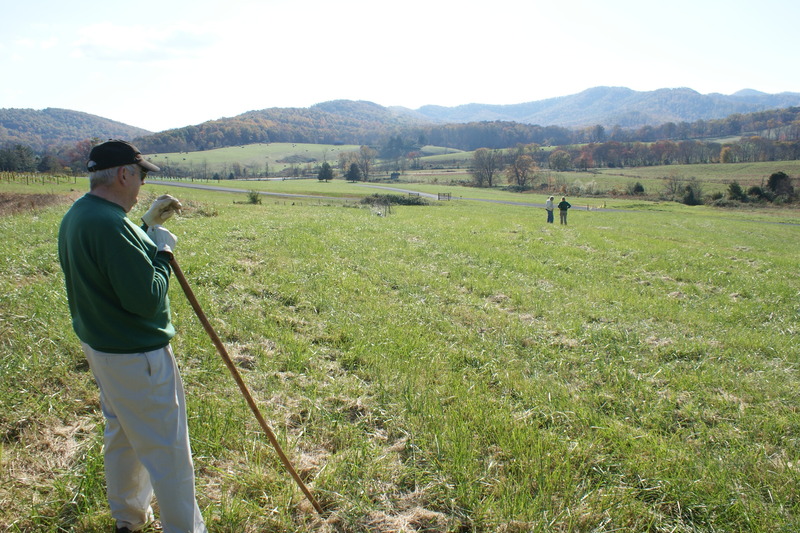 It’s rabbit hunting in its most casual and friendly form and it is conducted by Master Huntsman Arie Rijke, a native of Holland, but most recently a retired professor at the University of Virginia here in Charlottesville, VA. 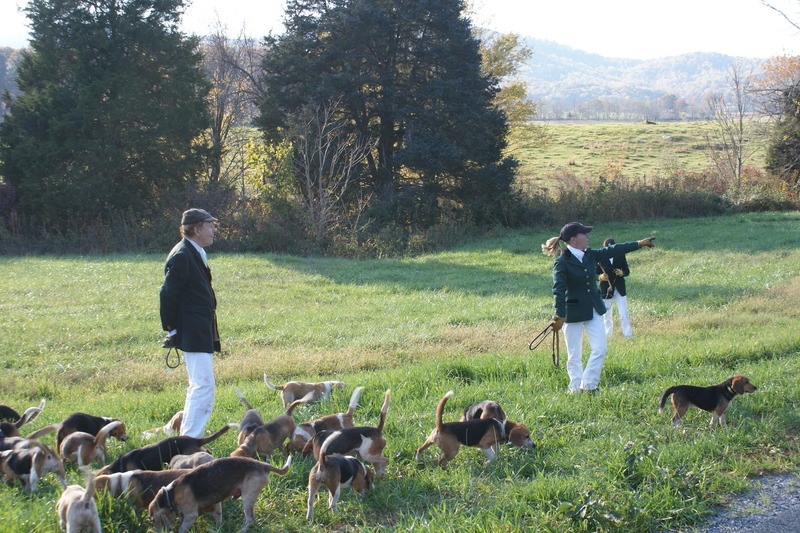 The beagle pack is the Waldingfield Club, which is the oldest pack in the U.S. and has been actively pursuing this sport for over 125 years. Beagling season generally runs from October through April and occurs most every Saturday, weather permitting. 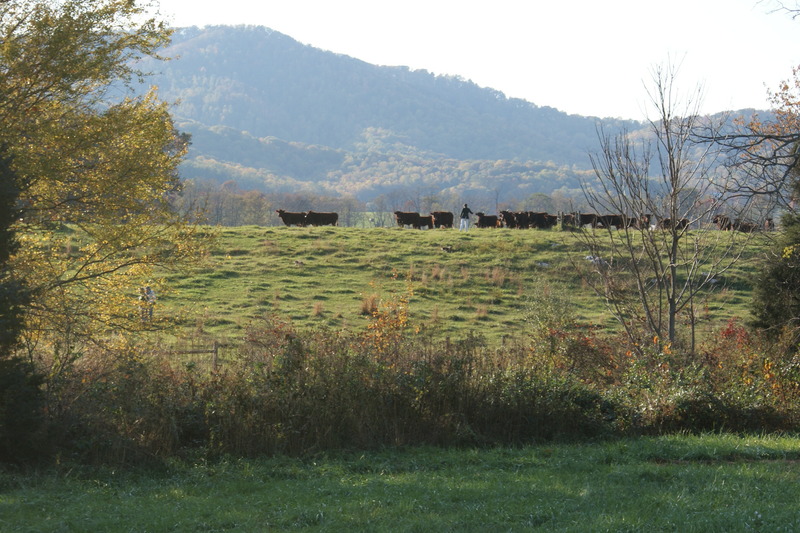 As you can tell from the schedule, it takes us to many different estates and farms throughout the foothills of the Blue Ridge mountains here in Central Virginia. 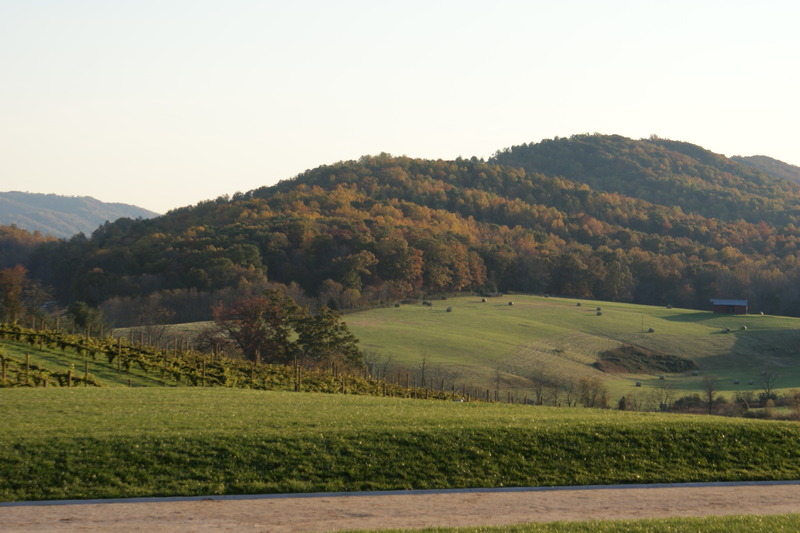 Autumn foliage, crisp winter air and beautiful spring blossoms are all part of the fare. 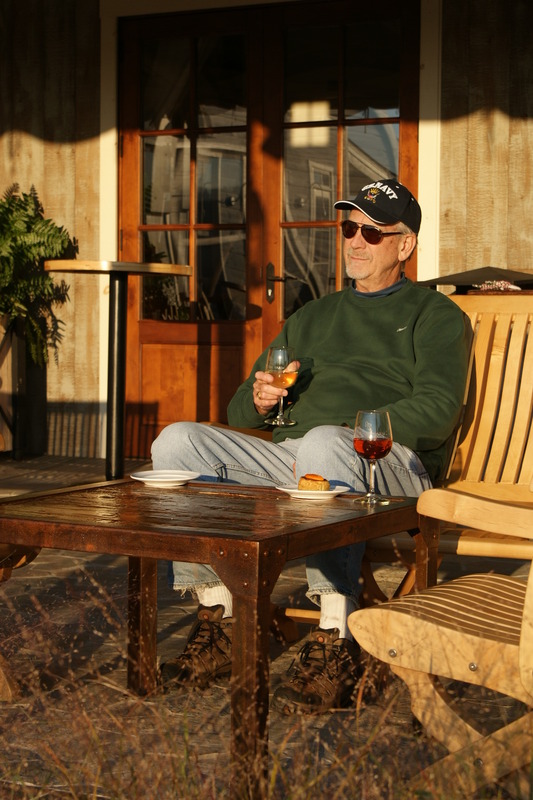 This past Sunday (a rare exception to the Saturday schedule) we hunted at the new Pippin Hill Farm Winery, a spot well worth visiting in its own right. 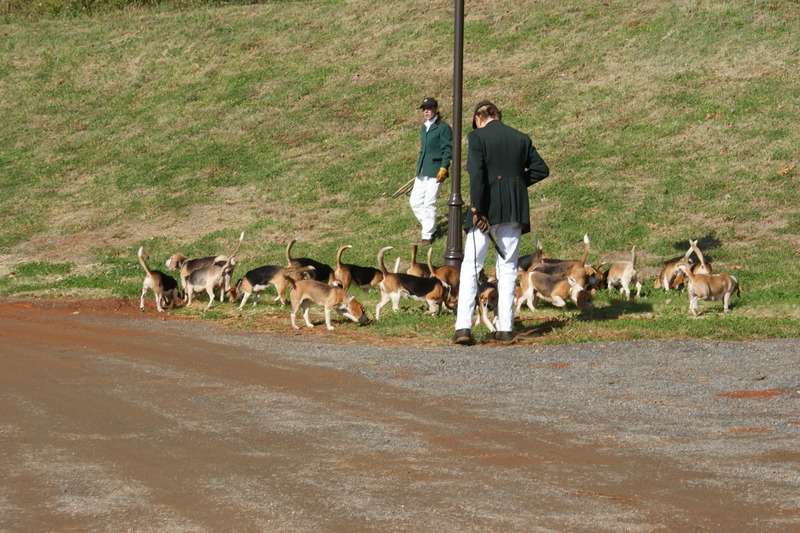 First the hounds (calling them “dogs” will immediately label you as a novice) are let out to stretch their legs and clear their noses. The Hunt Master then gathers them together to await the 3 o’clock hour and the sounding of the horn to begin the hunt. The patrons of the winery were surprised this week and couldn’t resist a lot of picture-taking and greeting of the hounds. The pack will be looking to flush a rabbit into running at which time they will “give tongue” (bay or howl) and pursue it as a pack. You can’t miss hearing that no matter how far afield you may be. Rabbits do not run in a direct line and will circle the hounds all around the field to eventually get back to their “home”. If the pack gets too close, the rabbit will go down a hole or a culvert and the hounds will gather there and bark to signal they have trapped their prey. Not so. Soon the rabbit has found the back exit and is off and running again, with the pack shortly to follow. 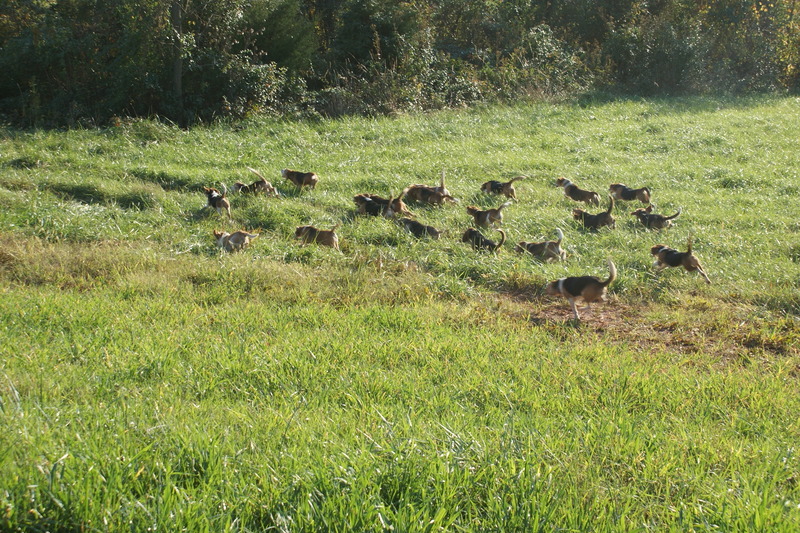 Today’s pack size was 10 1/2 “couples” or twenty-one hounds. The huntsman has several companions called “whipper-ins” who keep the pack somewhat assembled so that no hound will amble off to do his own thing. They never strike the hounds – the noise of the whip or a loud shout always brings the wayward canine into line. This is Henry Shelton, our friend and the “Field Master.” His job is to guide the observing group along and explain what is happening as the hunt progresses. 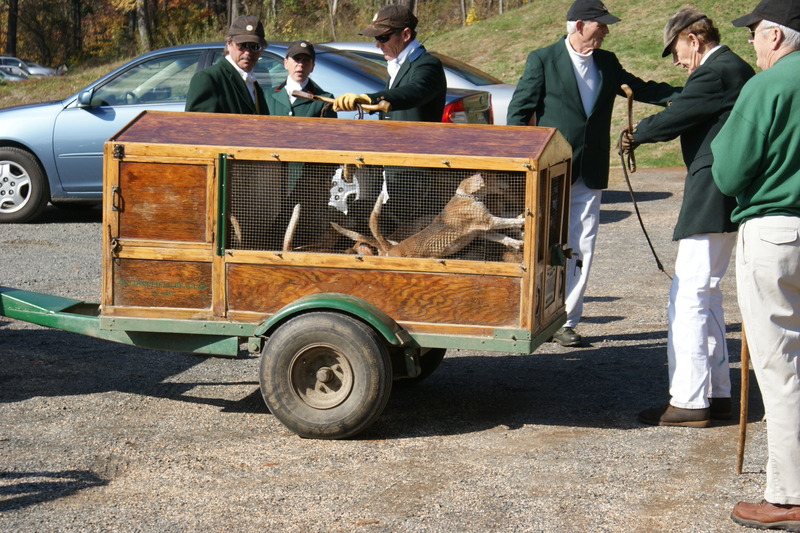 We are instructed to yell “Tally -Ho” if we “view” a rabbit so the huntsman can bring the pack around to that spot. 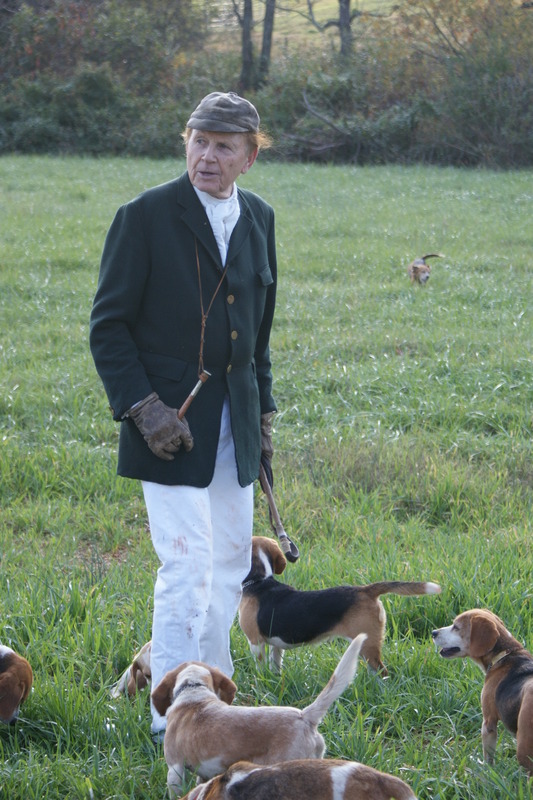 It is extremely rare that the hounds will actually catch a rabbit, but if it happens, the hunting group gather around the site, remove their hats and pay respect to the departed prey. Fortunately for Patty and me, we have never witnessed this aspect of the event. Of course, no firearms are allowed, as this is just an excuse for a delightful walk through some scenic countryside. Above left is Susan Bishof, joint owner of the club and Arie’s wife. 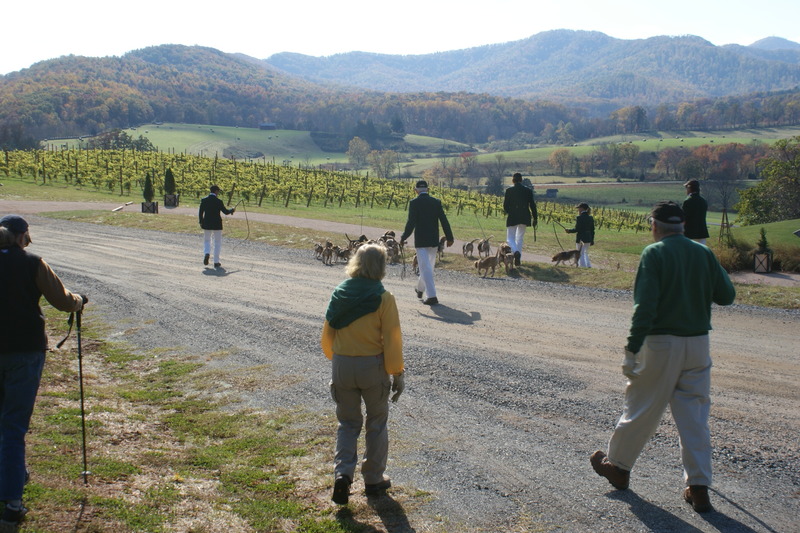 They house the hounds in kennels on their beautiful property called Ridge Lee Farm. She is explaining an aspect of the hunt to Patty. 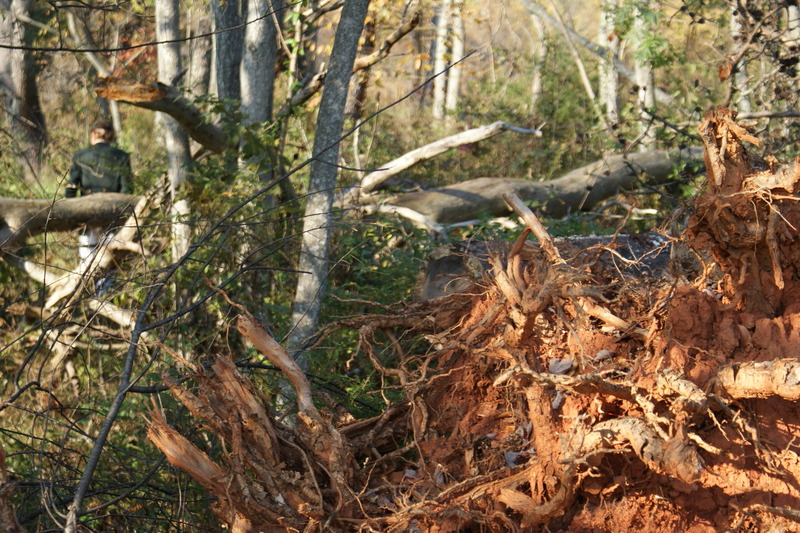 The trail can go through some pretty thick brush. Did I mention the thick brush? A "whipper-in" doing extra duty. Master of the hunt Arie Rijke, a true gentleman. The hunt lasts about two hours and sometimes may cover 3 to 4 miles in distance. After each hunt there is always a tea time. This can range from tea and coffee and snacks to more adult beverages and light hors d’oeuvres. Of course this is the more social part of the day where we chat about the hunt and any twisted ankles or frozen body parts. An exhausted "beagler" enjoying a much deserved tea time and taking in the view. If you’re ever in these parts, please do come and join us, it’s a hoot! 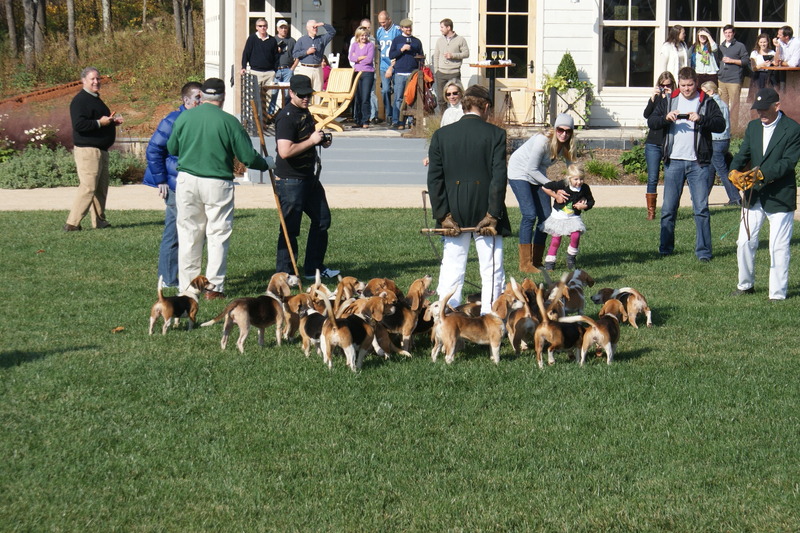 This entry was posted in Misc and tagged Beagles, Blue Ridge, Charlottesville, hounds, rabbits, University of Virginia. Bookmark the permalink. 27 Responses to Looking for that wascally wabbit………. Wilson met a wabbit once, but it was a big one. He came running back to us with his tail between his legs! He’s lucky. Remember what happened to the Knights that say Ni! 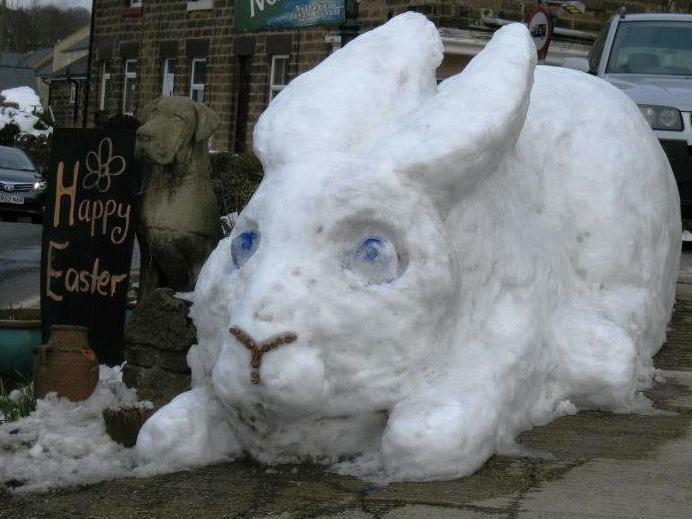 I always thought ‘snow bunnies” were good looking girls in ski gear. My goodness…your tea looks just like our wine. I think I would enjoy it over there!!!! Yes, we prefer to have our tea cold over here. I think this cup had been sitting around too long. It definitely tasted fermented. Thanks Viv. I’ve often enjoyed your comments at Tilly Bud’s. Especially the one exhorting her to give me the award. I will send you half of the prize money! I did this in the 1970s, with the same beagle pack and a UVA professor who was dating my friend, and who has since retired. I think his name was Ted and they called him ‘Th’ as I recall (a pretentious and somewhat famous sociologist). 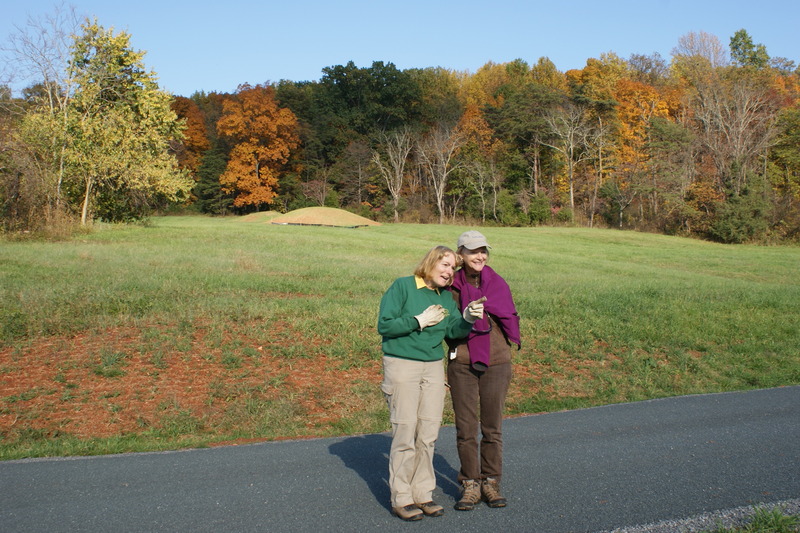 Our group tramped around the countryside and then retired to ‘Whiskey Ridge’ the home of the Jack Daniels heiress. The point seemed to be to get drunk. As I don’t drink anymore, I don’t do this type of exercise. Plus, it seems a cruel sport. Okay, i am a real party pooper. Tough!! I just look at it as a way to get out and enjoy the beauty of the area. I’d never get to see these vistas otherwise. They’re going to do it with or without me so why not go? As for cruelty: isn’t it also cruel when a rabbit gets taken by a hawk? As for getting drunk; although I’ve never seen it happen at these gatherings, it could happen at a quilting bee too, couldn’t it?. C’est la vie. Being a hound lover, this is something I’m sure I would enjoy immensely! The only problem is that I would want to love on those beagles all day instead of letting them run for rabbits. I can see my Lexi right in the middle of this. She would love it, and she can bay and howl with the best of ’em! We found 10 baby rabbits in our flower bed this year, and guess how we found them — Lexi took us right to them. She wanted to play with the bunnies. She would pick one up and carry it out into the yard. I would yell at her to put it down when it would squeal. She would put it down and push it with her nose. (Maybe indicating that she wanted it to run so she could chase it?) After we thought we had rescued all of them, I came out to get her to come inside so I could leave for work. She had found yet another baby bunny buried in the bushes. She had it in her mouth carrying it around. When I told her to come inside, she ran up the front steps with the bunny in her mouth. She was bringing her toy inside for the day. Of course I closed the door and yelled that she was not bringing that bunny in the house! What a fun morning that was! LOL. Take care Al, and tell your favorite Beagler hello from Northern Davidson County! That’s a great story Tammy. You’re right, I think the chase is all they really care about. I knew you would like this post as I remembered your comments before. I will pass your salutations on to Patty and hey from me to the gang at BDP. Thanks for sharing – I didn’t know about beagling. Looks like a lovely day in the country. Also looks like the exhausted beagler may have something besides tea in his cup. Just doing my part to support the local economy like the capitalist I am. 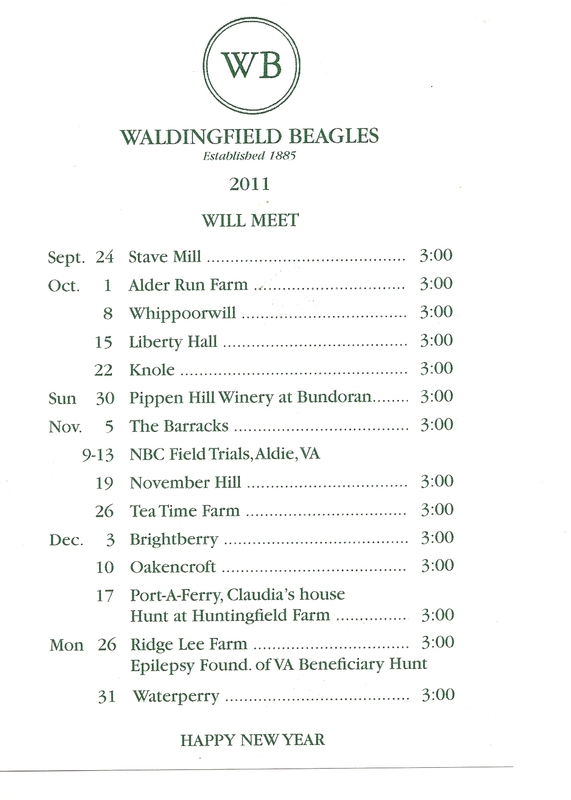 When I read this line, “The beagle pack is the Waldingfield Club, which is the oldest pack in the U.S. …” I had visions of a bunch of elderly beagles giving it their best slow-tail-wagging, meandering stroll through the fields aimlessly looking for rabbit-shaped Milkbones! Now that you mention it, I do remember seeing one of the beagles using a walker and a couple of others with hearing aids. Really enjoyed this Blog, Al. Beautiful scenery! Thanks Jeri. I couldn’t help but think what a lovely setting for a golf course. Looks like fun! I’d like to see you in hunting pink (those bright red jackets British hunters wear). I wouldn’t want to run the risk of being mistaken for Elmer Fudd. I enjoyed learning about this “sport” and seeing your pictures. I am a sucker for wascally wabbits but the beautiful scenery, fine company and a good walk in the woods would be delightful. Nice pictures! Right you are, winsomebella. Since we walk every day anyway, why not mix it up with a little fun and frivolity when you can? I remember this information from last year but you have more here, so thanks for all the new pics and stuff. I don’t think we even have enough free space up here in CT for an event like this. I wonder if beageling is done anywhere else…sounds like fun to me. Hi Cindy. Yes, I posted a couple of things on Facebook a year or so ago. This is more informative. It’s always a good time no matter where we go. I spent a fortune on wine after this one. Hope we don’t go to too many more wineries.